Welcome to Hedwig and the Angry Inch! 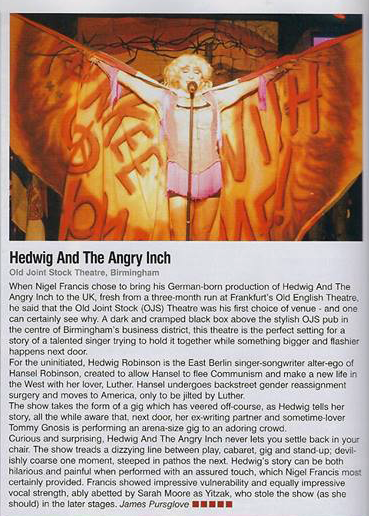 Hello and welcome to the official Hedwig and the Angry Inch website for the German production in Frankfurt. Here you will find everything you need to know about our show, including who's who, our very own Hedwig trailer, our brilliant press reviews and of course this will be the place where you'll hear all the latest news. So whether you like it or not have fun and we hope you enjoy the site. "Hedwig riss alle vom Hocker"
A big shout out to everyone who came to the Brotfabrik on Thursday night, you were a brilliant audience and it was a pleasure to perform this fantastic rock musical for you all. Thanks to all the staff and crew at the Brotfabrik who made us feel very welcome and for the great job they did with getting the show up and running. From all of us here at Hedwig and the Angry Inch Frankfurt a big thank you to you all. 5 star review from "What's On" in Birmingham. Nigel having a chat with The Coventry Telegraph & The Birmingham Post for the upcoming Hedwig shows at The Old Joint Stock Theatre. Hedwig and the Angry Inch will play a set at the Schirn Kunsthalle Frankfurt on Thursday 13th June 20h30. Come and see the Blonde Goddess before she leaves to rock the UK. Nigel Francis performing 'The Origin of Love', recorded live at the Neues Theater Höchst on January 23rd 2011 with pictures by Werner Dittmair. "You must see this show"